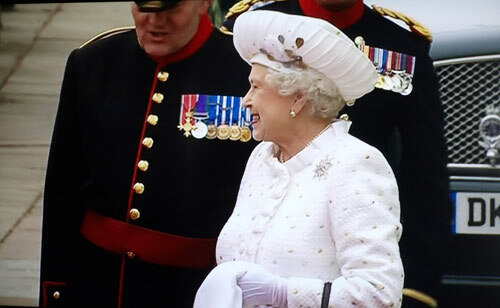 It took me a while to get worked up about the Queen's Diamond Jubilee. However, once I realised that it was the same weekend as my mother-in-law's birthday I was determined to have a Jubilee Tea Party for the family. The centrepiece of my Jubilee Tea is my 'Elizabeth' Sponge. It was definitely time to update the Victoria Sponge and what better time to do it than for the Diamond Jubilee. Victoria is the only other monarch who reached 60 years on the throne, so it is fitting that Queen Elizabeth II should have her own cake. 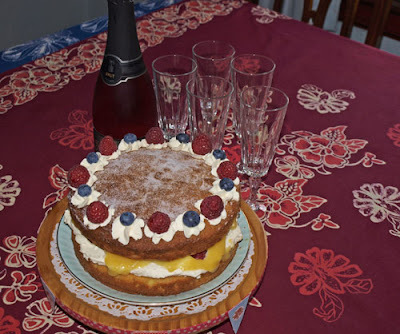 It's quite simple, the cake is a traditional Victoria Sandwich with the additional of the grated rind of a lemon in the mix. The filling is layered lemon curd, whipped cream, raspberries and blueberries, with a 'crown' of piped, whipped cream studded with raspberry and blueberry 'jewels'. 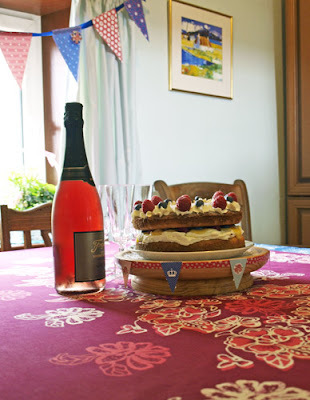 I hope you are having a fun time for the Jubilee, I'll be posting more recipes from my tea party but here is a picture of our table and bunting. Very creative Janice - love the red white and blue crown and it sounds delicious too. I love the idea of an 'Elizabeth Sponge'!!! Yours looks delicious, a very fitting centrepiece to a celebration. I hope you had a lovely party. Absolutely gorgeous . . . love the tip about using zest! The Elizabeth Sponge sounds so tasty, and looks lovely too. I'm sure your mother-in-law felt like royalty, with such a beautiful cake. Love the idea of a Elizabeth sponge - especially as it has been jazzed up with lemon! Great colours from the fruits on top too!